Polaris® Prospector Pro Track systems are designed, engineered and built specifically for Polaris® side-by-sides such as the RANGER and RZR models, so they deliver the best in performance, reliability, durability and value in every season. This track system’s mounting hardware, drive system gearing, and track design are all engineered and built specifically for the Polaris® side-by-sides. Polaris® track systems deliver the utmost in performance and productivity, with absolutely no compromise of vehicle cargo capacity or pulling power. OPTIMIZED WEIGHT DISTRIBUTION: The triangular geometry ensures optimized load distribution for the best flotation. The vehicle’s weight is spread over a much larger area, resulting in reduced down pressure and preventing your Polaris® side-by-side from sinking in. DURABILITY AND RELIABILITY: Triple sealed main bearings along with an oil bath bearing housing offer superior load ratings and resist contamination for longer life expectancy in the field. Extra wide rubber-coated mid rollers with double-sealed bearings resist ice build-up during the winter while spreading the load of the vehicle to increase floatation and maintain load rating on tracks. OUTSTANDING TRACTION: The rubber tracks on the Prospector Pro system are engineered to deliver the greatest bite, resulting in superior traction and pulling power. 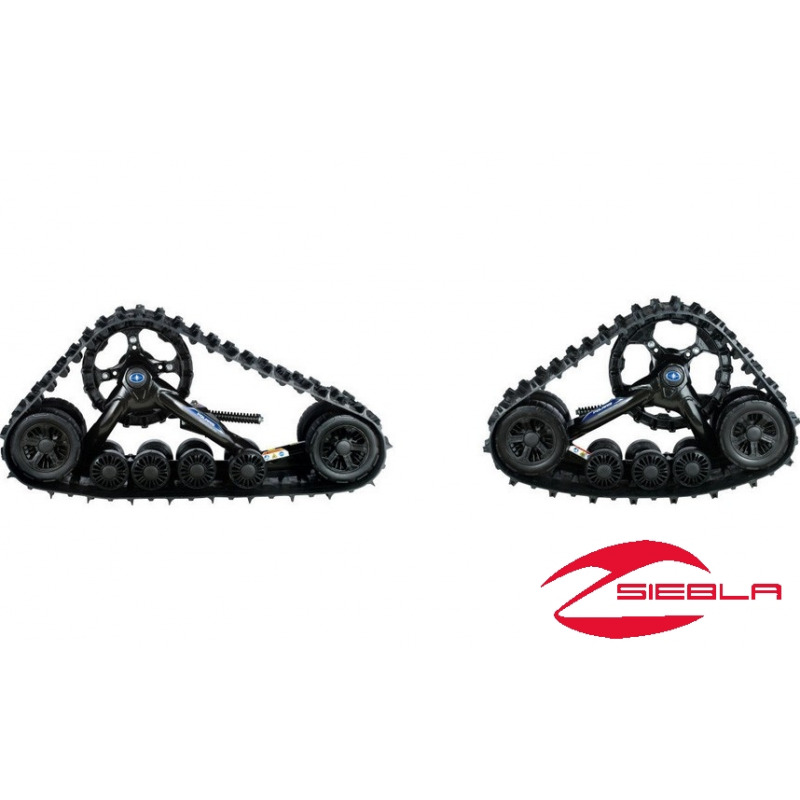 The tracks are precisely engineered to create optimized traction across the greatest track surface area. The track rubber compound and design resist deflection to maintain a stable contact patch on the ground to deliver the utmost in performance and comfort. These tracks are also ready for screw-in profile studs for enhanced traction. EASY STEERING, SURE HANDLING: Polaris® side-by-side track system steering is optimized by a combination of the rigid track frame, specifically designed Polaris® hubs, and track design. The result is the easiest steering, sure handling and reduced vibration. MODEL-SPECIFIC MOUNTING TECHNOLOGY: The track system brackets, mounting kits – and the drive sprockets – are all engineered specifically for individual Polaris® off-road vehicles. In this case, the Polaris® side-by-side-specific mounting hardware results in the best fit, reliability, durability and performance, as well as the easiest installation and removal of the track system from your Polaris® side-by-side. PREMIUM FRAME ENGINEERING: Polaris® track system frames are engineered for maximum rider comfort and minimal vibration. 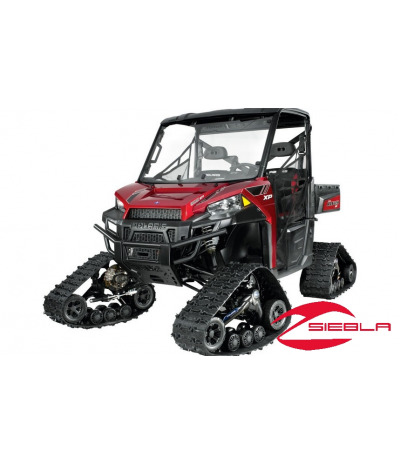 These frames are built for long-term, reliable performance, and they are designed to easily shed snow, mud, and vegetation. ANTI-ROTATION SYSTEM: The Prospector Pro System comes with a newly designed front and rear anti-rotation system with calibrated spring rates and dampeners to assist with better articulation and reduced adjustment. The rear track anti-rotation system allows the track system to pivot both front and rear to reduce trenching in snow and mud while backing up, and it assists your Polaris® side-by-side over obstacles, which enhances your mobility and productivity.